Ok, so you know soup is important to a meal as well as your dietary well-being, but time is not always on your side. Well, today you can beat the clock because this gem of a soup can be made rapidly. Oh no, you don’t open a couple of cans and plop them into a microwave, this is a rich-tasting, culinary comforting, made from scratch soup. You want soup with your meal for all the right reasons, so even if you’re strapped for time, this luscious potage can be your meal’s centerpiece. Please try it, you have nothing to lose, not even a lot of time. That’s it. 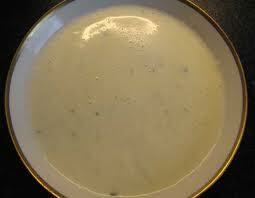 Not only is this quick creamy cauliflower soup simple and easy to prepare, but very delicious as well. I know some cauliflower loathers who enjoy this soup, and why not? It is very good groceries. mmmm i love cauliflower--i could exchange it more any meats! Hmmm, I just so happen to have some cauliflower in the fridge right now. Sounds like a plan for tonight's dinner. Thanks! LYNN PROCTOR: Yes, cauliflower is that good. Also goes good with cashews. SUSAN FLETT SWIDERSKI: Once you see how quick 'n easy it is to prepare this, you will make it often. Enjoy. JOYCE: I don't know. Am not very savvy with computers and most of my writing contacts are technical, not food related. I do appreciate how you think that much of these soups though. Thank You. I love cauliflower. Turning it into soup sounds like a great idea. Mmm, creamy cauliflower. And in my house, quick is definitely good. Another fine addition. This soup looks good. I think I might get hubby to try it if I added some crumbled bacon on it for a garnish. Or maybe some shredded ham or cheese in it. The shredded ham and cheese on top sounds really, really good. I love cauliflower. My daughter mashes it with salt, pepper and butter and serves it like potatoes..
You should def think about turning these posts into a cook book. THE GOLDEN EAGLE: I agree, it does make a fine soup. NATE WILSON: Thank You, your taste is impeccable. SUSANNE DRAZIC: Crumpled bacon or ham with cheese is an excellent idea. One time I made this soup and grated asiago into the pot. But I wanted to keep it simple as possible here. Thanks for your brilliant suggestion. DOREEN MCGETTIGAN: We often puree cauliflower with a little garlic and cheese as a mashed potato substitute. Your daughter, like you, is obviously a great thinker.